Designed for the multi -tasker, this highly functional and stylish design comprises of a bank of tall units housing a full fridge, full freezer, 2 side by side ovens, combi oven with warming drawer. 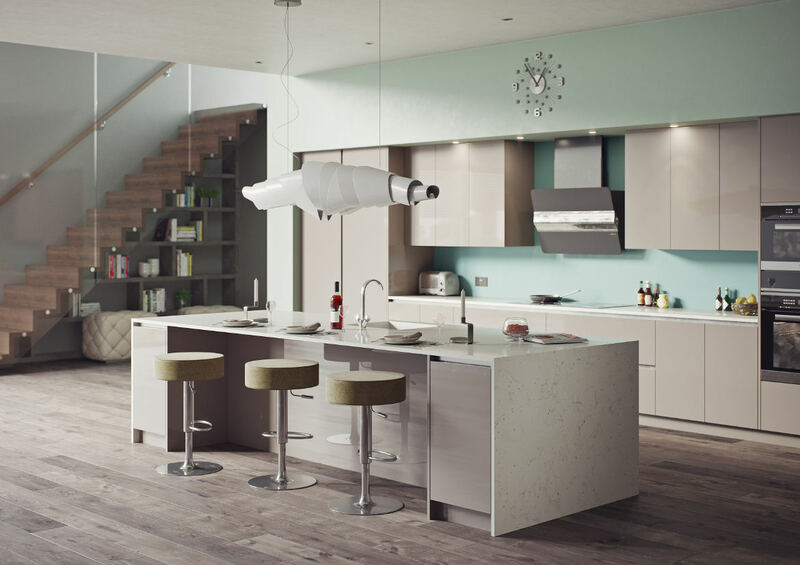 The unique, U-shaped island provides ample work surface around the cooking and washing zones. 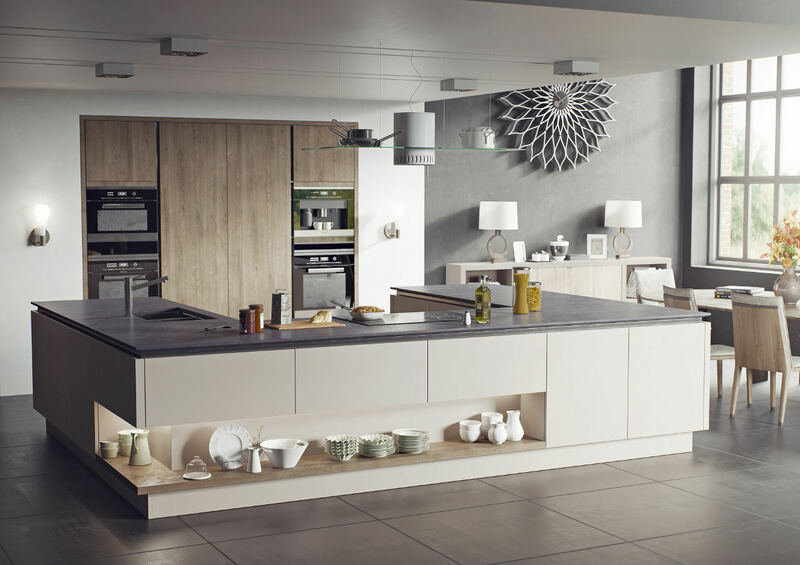 The combination of light grey and wood grain creates an appealing colour palette. 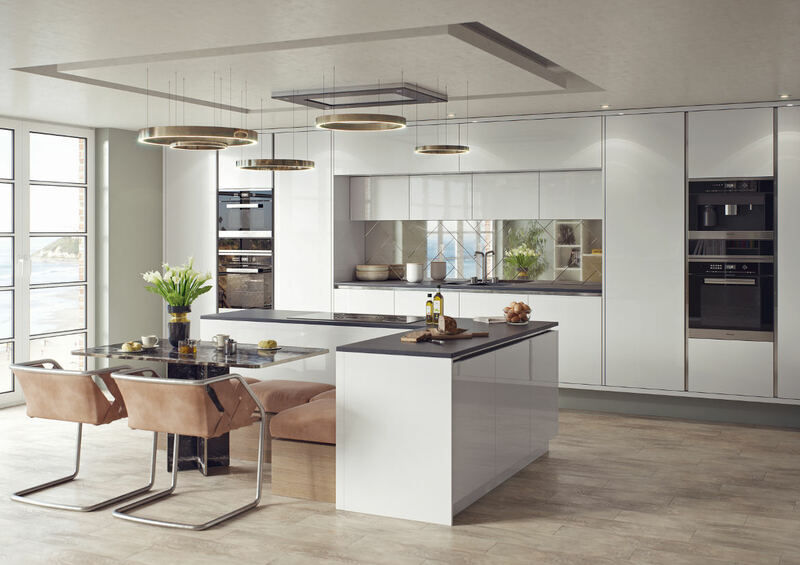 Bright, fresh and economical, featuring a statement L-shaped island with integrated seating, perfect for cooking, dining and socialising. The split tall bank create a slick, contemporary backdrop. The simple colour scheme empathises the streamlined design while reflecting light in the space. 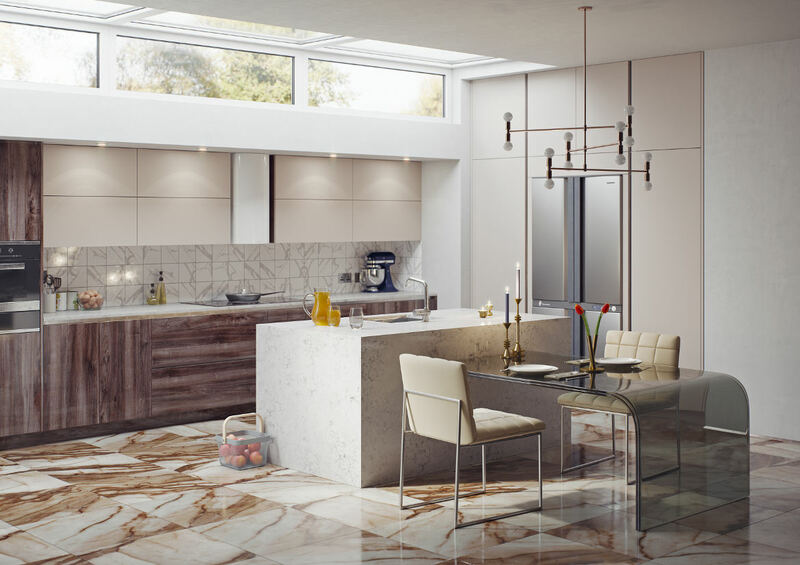 Designed for a busy home, the large central island with built in sink is a focal point with a generous seating area, finished with matching worktop sides for an easy to clean finish. 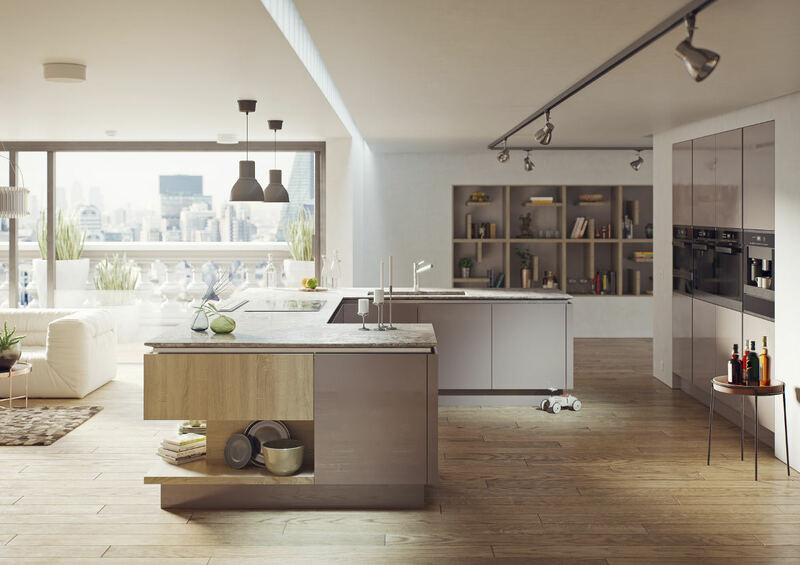 The cooking zone is adjacent to the sink making the extractor system a modern design feature. Simple, timeless, powerful: Monocrome never goes out of fashion! Black Reflection & Frost White create impact in this open plan design optimising the ‘less is more’ mantra. 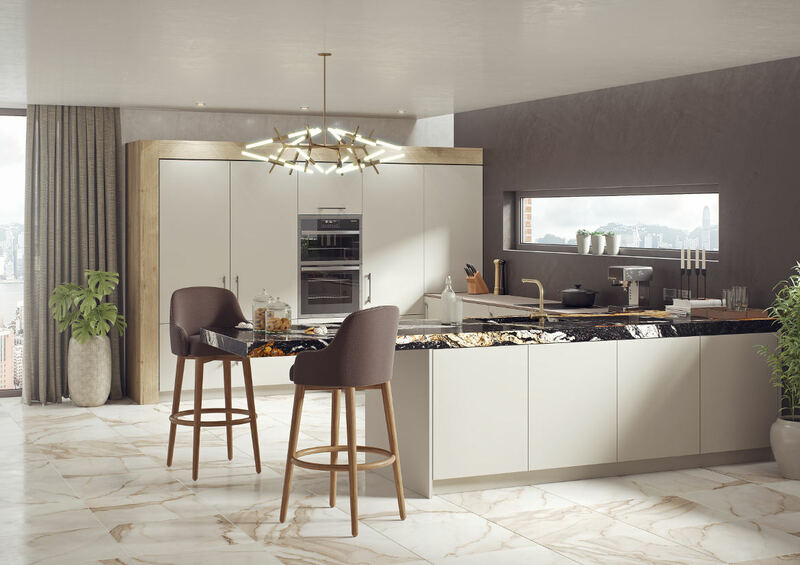 This kitchen combines the contrasting tones with a selection of closed and open units achieving a practical working design . Streamlined simplicity is the aim of this contemporary design. The bank of tall units combined with the linear form of the island, housing the sink and hob showcases the symmetry of the design. The two tone trend is growing in popularity; the soft contrast of Mussell and Dakar are the perfect pairing creating a warm, muted backdrop in your home. 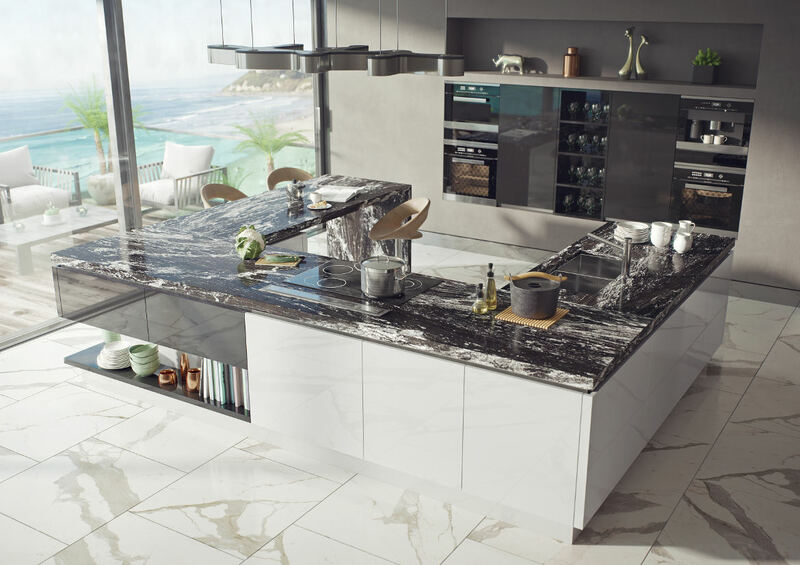 The large U-shaped island with sink and hob, complete with clever internal features such as pull out bins and hidden drawers, creates the ideal ‘work triangle’. 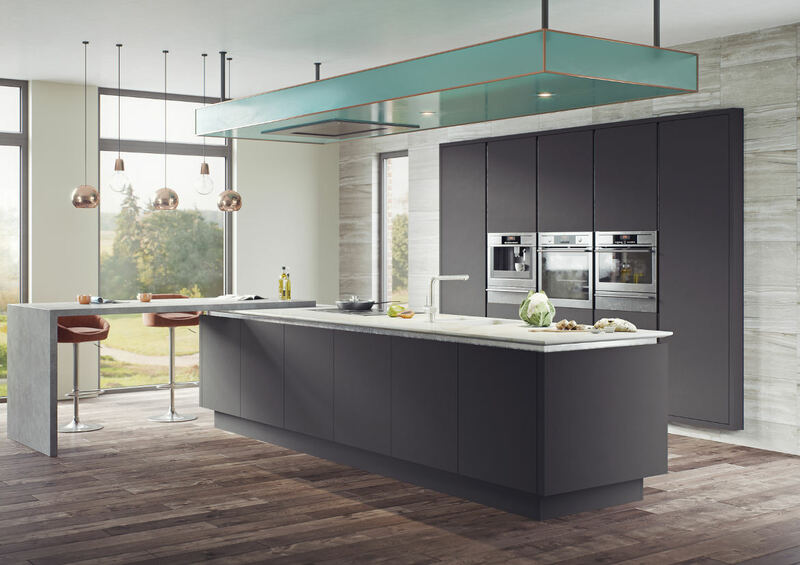 Mixing and matching textures can add another dimension to your kitchen; this subtle cashmere tone complements the timber grained finish on the tall bank beautifully . The supermatt surface, soft and velvety to touch, reflects light without creating reflection. 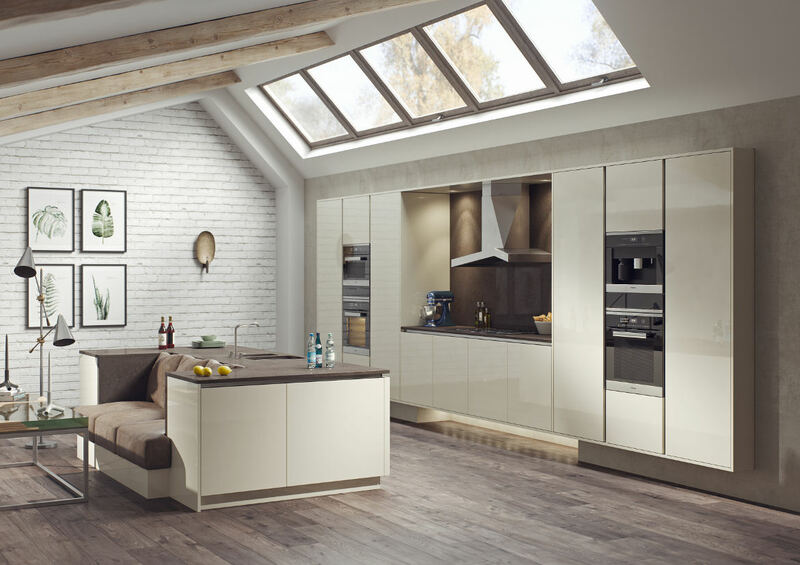 The warm, natural tones add to the spacious feeling of the open plan kitchen living area. Black can be a striking addition to any interior and works with virtually any accent colour. 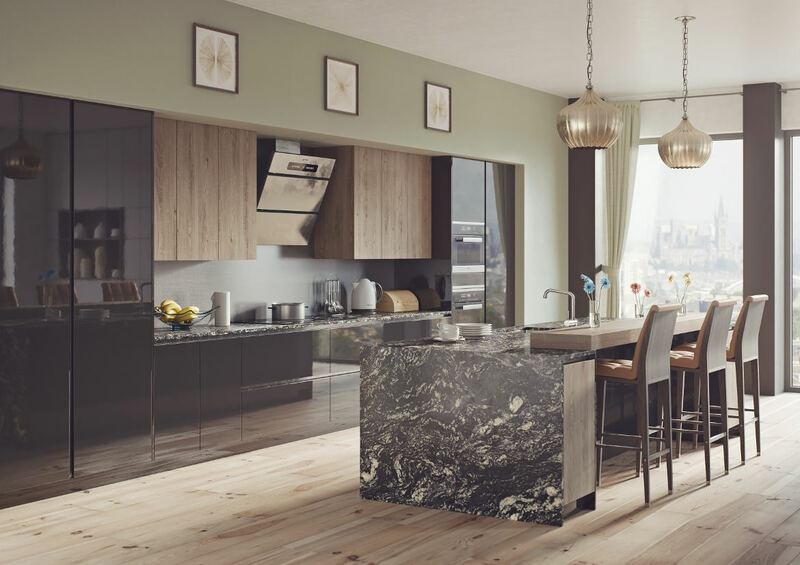 The island matching waterfall worktop creates an easy to clean finish while wood grain wall units with the wood grain floors add warmth to the scheme. No space for both an island and a dining table? This combination of a strong rectangular island with affixed glass table works for those tight spaces. The high window feature on the back wall allows for extra wall unit storage. Mira Cosa Reflection wood grain combined with Cashmere Super Matt brings this room to life. Mixing the old with the new - This converted barn with its original brick wall contrasts beautifully with the streamlined design of this handless kitchen, demonstrating that the new compliments the old in ways we never imagined. The cream tones are timeless, providing a calm backdrop for shifting tastes over time. 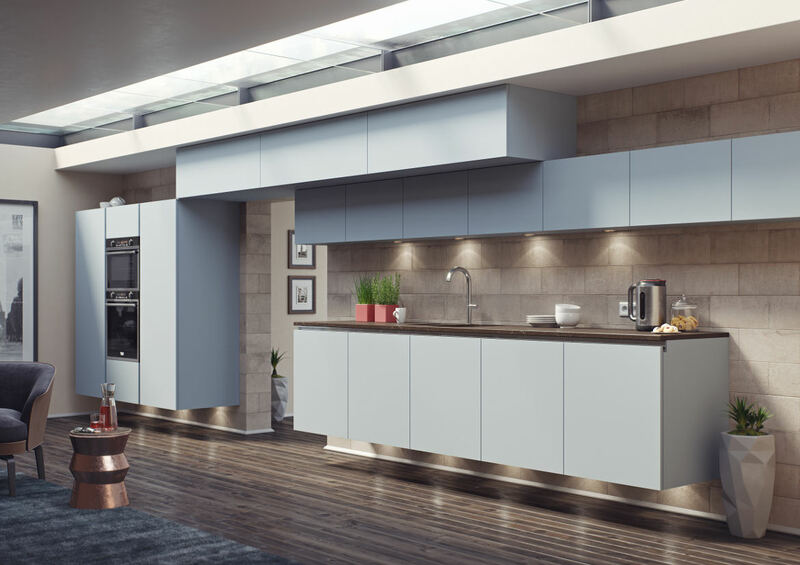 Dare to be different - The light calm blue tones in the denim kitchen pairs beautifully with whites, greys and other colours to complete the look. The supermatt fingerprint free finish is soft and velvety to touch. The dark walnut floor looks amazing against the denim coupled with the marble effect wall cladding . Unique and classy. 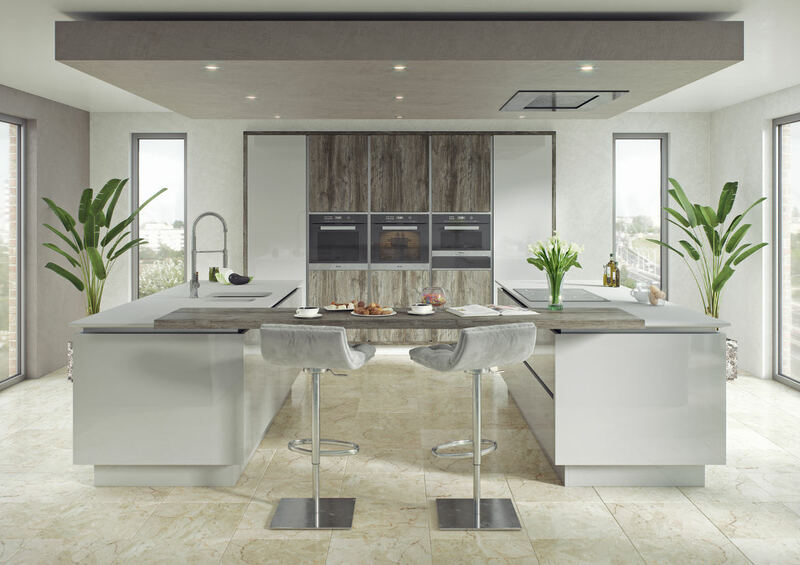 A charming mix of gloss and timber in a spacious living environment promotes peace and serenity - combining Elche wood grain with Stone Grey. The handles add an element of interest to the design, matching the stainless steel appliances. The practical, asymmetrical island allows free flowing circulation while the open units provide easy reach storage for dishes and tableware.